Original article and images published by Greg Ellis, Illawarra Mercury, 15 February 2016. A beautiful story about being helped and wanting to give back unfolded at Dapto Leagues Club in February during the Save Our Treasured Chests fundraiser. 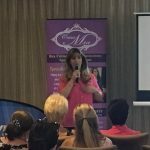 It started when Sarah Thompson attended aworkshop hosted by Mary Kay at the Lagoon Restaurant in 2015 and began applying what she had learned from BreastAware founder Maralyn Young. Not long after she found a lump and was diagnosed with breast cancer. She realised what she learned had saved her life and wanted to do something to help the message reach more people. More than 200 people responded and raised over $7200 for BreastAware which relies on donations to help it share the knowledge that is saving lives. Mrs Young was amazed how Mrs Thompson had organised the event while undergoing chemotherapy. “She is just a glowing beautiful woman. I want to say a big thank you..because…we are going to be able to go out and teach more women how to be breast aware”. Mrs Young described husband Sam Thompson as a marvelous support along with her great friend Ally Casanova. Mrs Thompson thanked Mrs Young for teaching women of all ages how to be aware of what to look for and the best way to find it. She recently met a teenager who was about to have a double mastectomy and said that was why it was so important. One in eight Australian women will be diagnosed with breast cancer before the age of 85 and the numbers are growing. It is hoped that can be reduced with early detection. The next BreastAware workshop is being held at the Lagoon Seafood Restaurant on March 7, 2016.